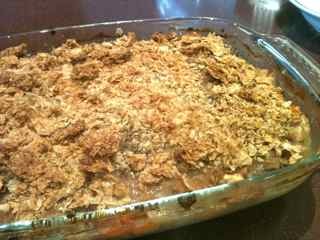 Here is an easy recipe with ground beef - Ground Beef Apricots topped with weetbix and baked. This is a one-pot meal, made in a rectangular lasagna dish, and popped directly into the oven. This recipe serves 4 - 6 persons. Serve with short pasta and a fresh salad. This meal takes less than 10 minutes to prepare and then it goes straight into the oven. Oven baked meals are convenient as it frees your time for other chores while dinner's in the oven. Replace apricots with whatever tinned fruit you have in the pantry. To extend the meal further, add more carrots and diced potato. There are more easy ground beef recipes for your family to enjoy. Like this one, it takes no time at all.